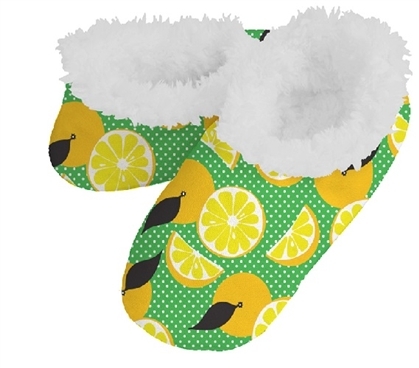 Sure lemons are sour, but these Dorm Snoozies are oh so sweet! Who wouldn't love to start their morning with a bright, fresh, and very cute design! College dorm floors are always freezing cold in the morning, no matter how warm it is outside. It can be a harsh way to wake up when your dorm alarm clock goes off. Avoid stepping on that freezing cold dorm floor by keeping a pair of super cute Squeeze Me Dorm Snoozies by your dorm bed! Our Squeeze Me Dorm Snoozies are cute, but they are also incredibly comfy. Not a sock and not a slipper, they're are cozy foot coverings that are made with a brushed fleece exterior and super soft Sherpa on the inside. Dorm Snoozies are so incredibly soft you will never want to take them off! Our Squeeze Me Dorm Snoozies also have a non-skid sole so you don't slip and slide in them when you're dancing, walking or jumping for joy at how cozy your Dorm Snoozies are. Snoozies are that soft and comfy that they're worthy of their own rap!